Having worked in the food service industry for 20 years—16 of those as a dog owner—you would think I might have baked dog-specific treats before now. Well, until yesterday, I hadn’t, but given that it was my boy Hudson’s 10th birthday, it seemed liked a good time to start. I knew I wanted to make cupcakes, so I went online and did a quick search. 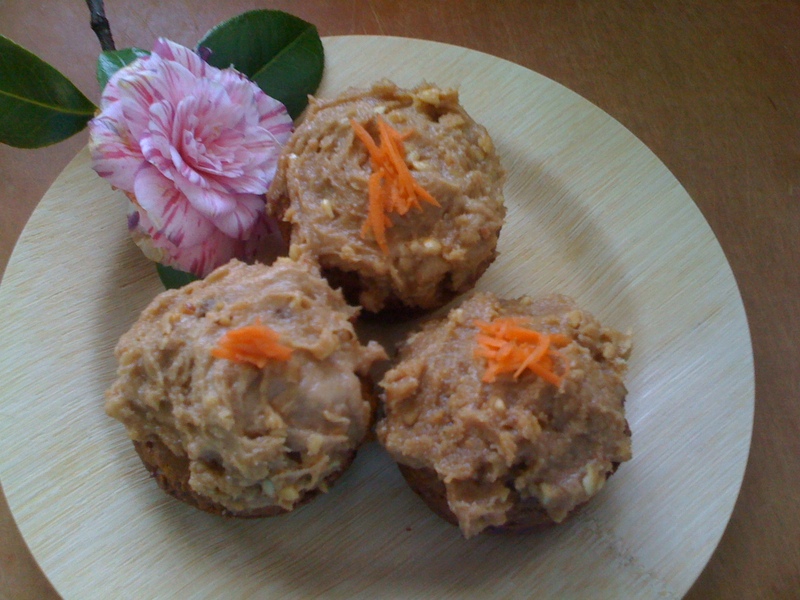 Recipes were easy to find, and when I saw one on allrecipes.com for peanut butter-carrot cupcakes, my decision was made. What follows is my tweaked version of the recipe, but I’m including the original link below. Hudson (shown at right with cupcakes) loved his birthday cake, and he carefully licked off all of the frosting before eating the cake. Preheat oven to 350° F (175° C). 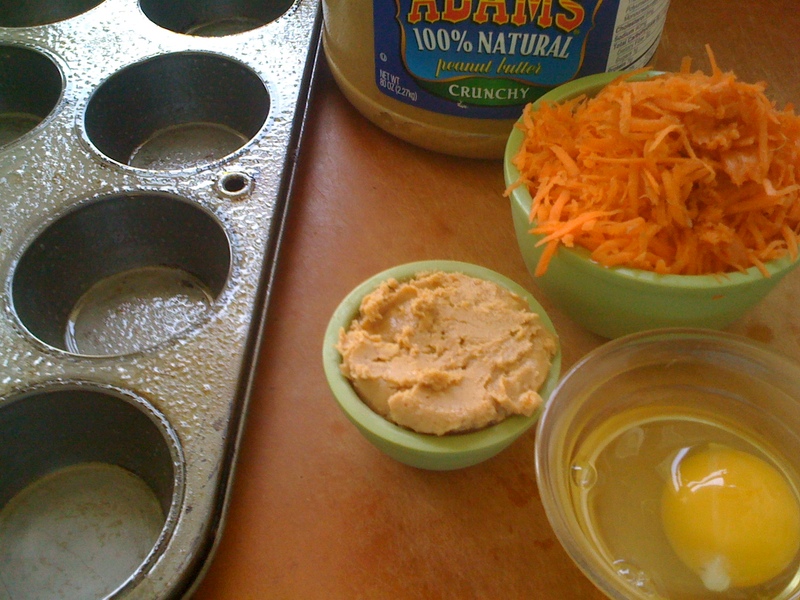 Grease a 6-cup muffin tin (or use a 12-cup pan and half-fill the unused cups with water). Combine egg, peanut butter, oil, vanilla, and honey in a large bowl; blend well. Stir in carrots, and mix thoroughly. Sift together the flour and baking soda, and fold into the carrot-peanut butter mixture. Spoon cake batter into prepared cupcake tins. Bake in preheated oven for 40 minutes. (They are dense, so they take a while to bake.) Let cupcakes cool in pan for 5 minutes, then turn out onto a wire rack to cool completely. While the cupcakes cool, prepare frosting. Using an electric mixer, beat peanut butter until light and fluffy. Add in apple butter until thoroughly combined. 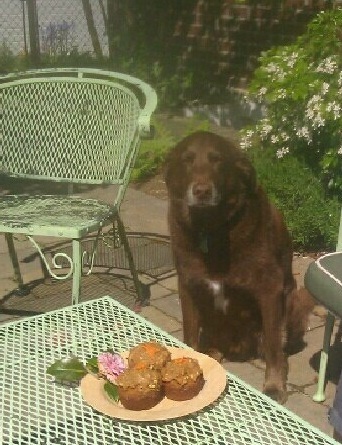 Ruby (at left) also loved the birthday cupcakes. In fact, she even offered to help Hudson eat his because she thought he was eating too slowly. 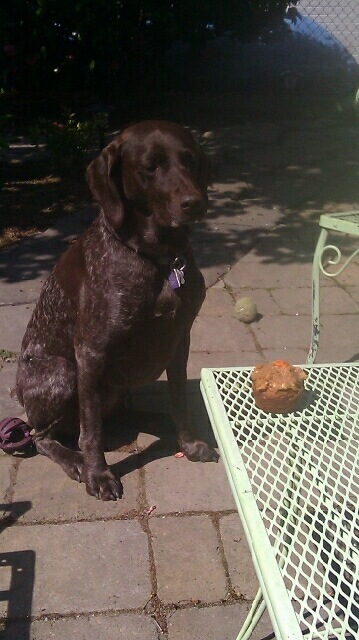 Here is the original recipe for Doggie Birthday Cake. This entry was posted in Desserts, Recipes and tagged Baking, peanut butter, Recipe. Bookmark the permalink.